Here’s your path into the wild! Along the boardwalk you will experience the heart of the strand and see how this landscape was shaped by water, time and mankind. 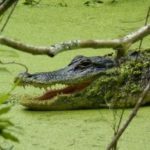 Permitted Commercial Operators will include your adventure on the Big Cypress Bend Boardwalk on their tours, and a portion the proceeds of their ticket sales supports the Park and its programs. You also can visit the Boardwalk independently; read about it on our Visit the Boardwalk page. You may also choose to have the Friends of Fakahatchee arrange a custom tour for your group that includes the Boardwalk. Contact Executive Director Francine Stevens at info@orchidswamp.org for more information. The information contained in this website is for general information purposes only. The permitted commercial operators above are independent contractors and are not owned by or affiliated with FOF or the DEP. Any bookings or ticket purchases should be made directly with the respective Permitted Commercial Operators who are solely responsible for providing the contracted services. The information in this website relating to the permitted operators is provided by them and has not been verified by FOF, and while we endeavor to keep the information up to date and correct, we make no representations or warranties of any kind, express or implied, about the completeness, accuracy, reliability, suitability or availability with respect to the website or the information, products, or services, contained on this website for any purpose. Any reliance you place on such information is therefore strictly at your own risk.